I'm sure you all remember the post about the good Inquisitor where I talked about Forge World's customer service (by way of email). I got some helpful suggestions from some readers and lots of comments... the big one being that you had to call them to get any resolution. I suppose that works fine if your in the UK, but can be problematic for someone like me. I did however get an email address of a real person at FW and I sent them the same email asking about my problem. Unfortunately, we can only send replacement parts out to our customers. So we would require your client who ordered directly from us to contact us with regars to the problem. We can then get a replacement piece cast up and sent out to any address they wish. However due to UK Data protection laws we cannot speak to anyone other than the person who placed the order with regards to an order or issue arising from an order. OK, makes sense to me. I contacted my Client and let him know about it. 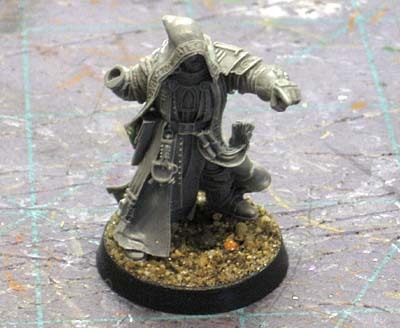 He no longer had his ordering information and elected to have me do the conversion for the piece instead of chasing after Forge World for another few weeks. There comes a point when it's just not worth it you know. So... I picked out what I thought were a couple of useable sword options and sent them to my Client. He chose the one on the far right so it's up to me to make the conversion look seamless. It begins with cutting away the portions you don't need and making sure all the surfaces that are going to be glued together are smooth and clean. Blade from one bit, hand from another, hilt from another, it's lots of cleaning and such to make sure everything fits just right. And here's the finished product. After building the new blade, it still looked incomplete. First, it had a slight Chaos feel to it and second, it looked a little plain. The blade has got a great shape and it definitely makes him look tougher wielding the heavier looking weapon as compared to his original blade, but it was "off" visually. I needed to do something when I realised that what I was missing was the detail in the blade that's in the rest of the model. 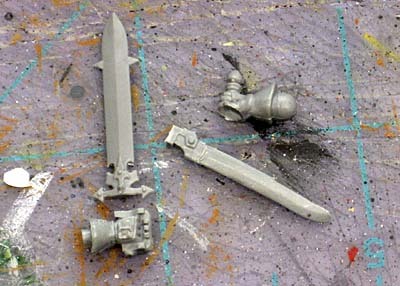 And even more specifically, there needed to be an Inquisitional feel to the weapon. Fortunately, I still had the Forge World brass etchings from a previous project (the Deathwatch drop pod) that I was able to use. 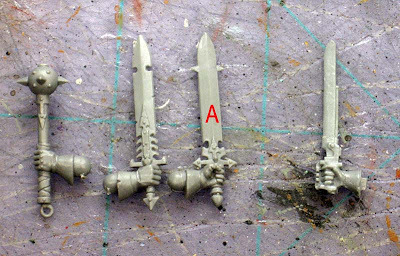 I cut away the pointy bit near the handle of the blade, scraped it smooth and added one of the smallest Inquisitional symbols off the sprue. Given the shape of the blade, the symbol has been inverted but it fits perfectly. Visually, it completes the weapon and you'd never know it was changed out if you hadn't seen the original one up close. Another small addition was the little bit at the bottom of the handle, a small bulb shape that adds some balance to the weapon and makes it look complete. I just finished painting his servitor skull and that was another whole production I'll go into in a later post. I'm hoping to get painting on this guy in th next day or so. I really have to say, the conversion looks great! The original blade being warped was a blessing in disguise. Your converted blade here looks far better than the original ever did, plus it makes a great figure even more unique. Great looking conversion and nice work. 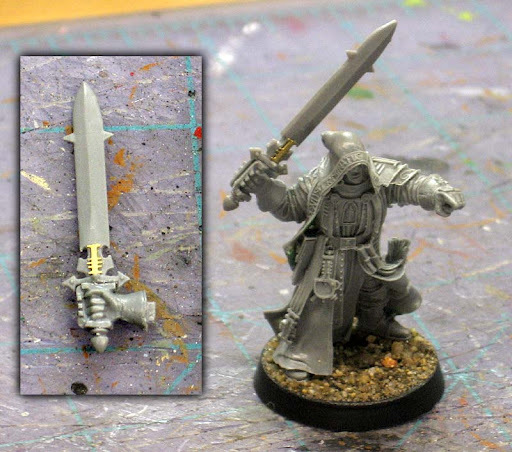 I like this blade much better than the original and now your client has a one of a kind mini. Well done. Did you ever call up Forgeworld or get a response to your email? Thanks guys. I'm happy with the final model and more importantly, my Client likes the conversion as well. Dictator: No response to my original email but I did get a reply when I sent it to an actual person there. The short answer is this, my Client would have to do all the leg work for the bit and then get it to me so I could finish the project. This model is cursed. My sword hand also vanished, so I converted it to use a metal bionic hand. Just before Xmas, my friend managed to completely floor the model, breaking off the other hand and forever losing his pointing finger. Not sure I have the heart to ever paint it! Taerij: It's a tough model to get together. Painting him has been a challenge too, but once I figured out my color scheme though, it's been fairly smooth sailing after that.